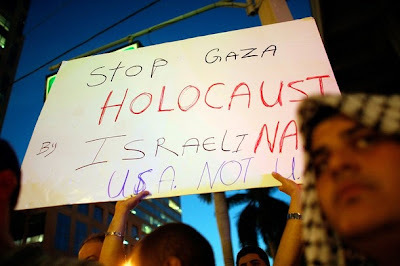 FORT LAUDERDALE, FL – DECEMBER 30: Palestinian supporters rally to bring attention to the bombing campaign Israel has unleashed in the Palestinian territory of Gaza on December 30, 2008 in Fort Lauderdale, Florida. Responding to continued rocket attacks by Hamas in Gaza, Israel has carried out air strikes for four days. According to the White House, U.S. Secretary of State Condoleezza Rice is leading intense diplomatic efforts to pressure a cease fire between Israel and Hamas. 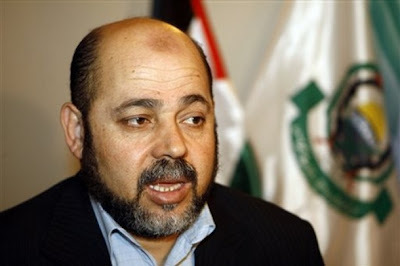 2 days ago: Hamas deputy head, Moussa Abu Marzouk talks during an interview with the Associated Press in his office in Damascus, Syria Monday Dec. 29, 2008. Abo Marzouk rejected any talk about truce with Israel before it stops attacks on Gaza and lift the siege calling on Arab states with relations with the Jewish state cut these relations. This is interesting as it is a current AP Photo and caption of the man who wrote the Hamas Manifesto published in Trinity United Church of Christ (TUCC) bulletin, on the Pastor’s Page, by Obama’s pastor, Rev. Jeremiah Wright. Could we get the press to print the simple fact that Jeremiah Wright lent a voice to Hamas? Was there a conversation in the press that Obama was a member of the church at the time of the publishing of the Hamas Manifesto? Of course not. Marzouk is a founder of CAIR’s parent organizations, the Islamic Association for Palestine, found liable for the murder of an American youth in Israel; the Holy Land Foundation, and the United Association for Studies and Research – all now shutdown by the U.S. Treasury. Musa Abu Marzuq was arrested at Kennedy Airport in July 1995 on charges of murder and attempted murder for Hamas, the other fundamentalist Islamic group that repeatedly engages in terrorist acts against Israel. At the time of his arrest, Abu Marzuq–a permanent resident of the United States for five years–headed a Washington-area think tank called the United Association for Studies and Research. Simply Jews always has great probing commentary and today does not disappoint. The truth is often ugly. Mix the press and their often convoluted version of the truth and it is a picture of obscenity. In the propaganda war that unfolds around the war in Gaza, the sides follow the old played out scenario. Our FM and its tentacles declare a “hasbara” offensive that in a few hours becomes overwhelmed my the well oiled (pun intended) wave of Muslim histrionics, accompanied by a not much more subtle chorus of their friends. “Friends” could be a bit of a misnomer, though, the people of this kind are motivated by their hate to Israel rather than by their passion for Islam, Palestinians or anything else. As Israeli journalist Amos Harel wrote in Ha’aretz at the weekend, “little or no weight was apparently devoted to the question of harming innocent civilians“, as in US operations in Iraq. Like the U.S. assault on Iraq and the Israeli response to the abduction of IDF reservists Eldad Regev and Ehud Goldwasser at the outset of the Second Lebanon War (the “night of the Fajr missiles,” a reference to the IAF destruction of Hezbollah’s arsenal of medium-range Fajr missiles), little to no weight was apparently devoted to the question of harming innocent civilians. כמו ארה”ב בעיראק וכמו המהלך הישראלי בתגובה לחטיפת חיילי המילואים רגב וגולדווסר בפתיחת מלחמת לבנון השנייה (“ליל הפאג’רים” שבו הושמד מערך הרקטות לטווח בינוני של חיזבאללה), גם הפעם לא ניתן כמעט משקל לשאלה כמה אזרחים חפים מפשע ייפגעו בהפצצות. IDF has its faults, its f-ups and its villains, but one thing I know for sure, not even being a military correspondent: IDF invested months of effort and intelligence gathering to choose its targets having in mind maximum “awe and shock”, that’s true, but to the same degree of importance (even higher due to accumulated knowledge of previous botched attacks) minimum civilian victims. Even the Hamas and other non-Israeli sources confirm that the first wave of attacks reached its designed targets – overwhelmingly Hamas “militants”. Read more the full article at Simply Jews.